Sonoma on a Bike invites you to join their classic Napa bike tour. It’s designed for those who like to enjoy a bike tour with all their senses fully engaged. Take the time to come and breath, and take in the beauty that you will find in the lush landscapes with its vineyards, valleys, vistas, hills, mountains, parks, rocky coastline, crashing waves, farmland, and forests (including those majestic and magnificent redwoods). It’s a slow, sensual trip. If that sounds somewhat provocative, and possibly a little self-indulgent, so be it. It’s a gift to be given, and shared, with someone you love - including yourself! Located 67 miles north of San Francisco, Hotel Healdsburg encompasses the Sonoma wine country’s simplicity and charm. The hotel is set on the western edge of Healdsburg's historic town plaza, and guests can enjoy some of the world's finest vineyards, restaurants, and shops within minutes of the front steps. Beautifully appointed guest rooms, country gardens, pool, and the luxurious spa provide a tranquil setting for guests to relax within the hotel grounds. Hotel Healdsburg also offers a broad range of meeting and special event spaces for executive board meetings, wedding celebrations, wine tasting, lectures, and other occasions. Dining is a highlight of the hotel where guests can savor Sonoma County's bounty of extraordinary wines and fresh seasonal ingredients at acclaimed Chef Charlie Palmer's Dry Creek Kitchen. Las Alcobas Napa Valley is nestled in St. Helena, California. Occupying a stately, Georgian-style farmhouse originally constructed in 1907 and situated adjacent to the storied Beringer Vineyards, the hotel offers guests a curated travel experience in the heart of California's wine country. Elegantly designed using luxurious natural materials and a soothing, neutral palette, this historic resort boasts 68 rooms and suites, many of which feature a beautiful outdoor terrace and vineyard views. Guestrooms are spectacularly appointed with Rivolta linens, oversized bathrooms, and custom-designed furniture. Nestled in the beautiful Sonoma Valley just four blocks from historic Sonoma Plaza, MacArthur Place is a boutique, 64-room luxury hotel and spa set in the midst of wineries, fine dining, shops, and galleries. The rich history and quaint charm of MacArthur Place make it the perfect destination for an unforgettable getaway to both Sonoma Valley and Napa Valley. Think of this bike tour as rolling theaters of wine country life that change with the seasons, rather than set point-to-point trips. 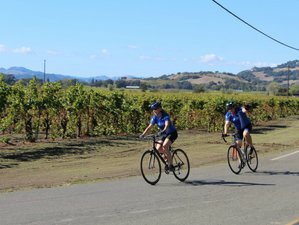 Sonoma on a Bike offers a hands-on opportunity to discover all the hidden adventures, wine tastings at family-owned wineries, gourmet treats (think regionally inspired, the locally-grown cuisine at Michelin restaurants), and unique events that Napa County has to offer. All of that with none of the hassles. The classic tour offers biking routes that are rated moderate and vary in length each day from 20 to 40 miles of surfaced roads. You’ll be cycling over rolling hills to flat, coastline roads, but Sonoma on a Bike can also offer more challenging routes for those who ask. You also have another option up your sleeves: a van will carry your prized purchases, bottles of that incredible wine you just tasted or, should you want it, up the next hill. You can expect an amazing itinerary of experiences while biking the region’s beautiful country roads. You might find yourself face-to-face with a herd of goats while sampling the artisan cheese maker’s wares or enjoying an elegant lunch with world-class wines, created by the chef at a hidden estate. Depending on the season, you might picnic under 1400-year-old redwoods, up close and personally. You’ll do your bike fitting and safety talk at the Sonoma on a Bike office, then hit the trail! You’ll head into beautiful Green Valley to enjoy wine tasting and a gourmet lunch. From there, you will ride north to the world famous Dry Creek Valley AVA (American Viticultural Area), all on quiet, meandering back country roads. After a restful night, it’s time for another day of tasting and cycling! You’ll taste old vine zinfandel before heading to Alexander Valley AVA (American Viticultural Area) for spectacular scenery, lunch, and an optional challenging climb. Then, you will continue to Napa Valley to visit some off-the-beaten-path wineries. This day offers a challenging or relaxing cycling route. The challenging route will take you into neighboring Chiles Valley AVA (American Viticultural Area) on the other side of towering Mount Saint Helena. The relaxing route will follow the Silverado Trail, traversing the best of the Napa Valley floor. Regardless of what you choose, a farm-to-table dinner awaits at the end of the day. Now, you head south to enjoy the Los Carneros AVA (American Viticultural Area) region of Napa Valley before going back in time at the historic square in downtown Sonoma. Relive history and visit the adobe barracks, or taste wine at any one of the nearby wineries. Sonoma on a Bike recommends a quick, lightweight, road bike for traversing the roads. They also offer the Specialized Turbo (in medium and large) for those looking for an easier ride. In addition, they’ll outfit you with protective helmets, water bottles, and handlebar bags to keep your personal necessities at your fingertips. There will be a guide biking along the route with you each day. In addition, a second guide in a van will be sweeping the route periodically to check on how everyone is doing. The van is available for transporting purchases and, if you desire, transporting you. Once you give your luggage to your guides at the start of the trip and each morning when you are moving to a new hotel, the guides will ensure that your luggage is transported safely to your hotel. People of all fitness levels can enjoy Sonoma on a Bike. If you can comfortably bike 20 - 30 miles each day, then you will be able to enjoy this trip. Sonoma on a Bike is about the journey, it is not a race. It is about experiencing what is special about Sonoma County. Randy Johnson is the CEO of Getaway Adventures and has been a bike aficionado and passionate explorer of Sonoma County for over two decades. He has a well-earned reputation for nosing out those quirky, fascinating and completely one-of-a-kind experiences that only the locals may know about. He also likes nothing better than celebrating his discoveries with other adventurous spirits. The tour will start from Santa Rosa (Sonoma on a Bike’s office) and take you to Healdsburg, St. Helena, and Sonoma city. The route will cover Alexander Valley AVA (American Viticultural Area), Dry Creek Valley AVA (American Viticultural Area), Napa Valley, and Los Carneros AVA (American Viticultural Area) region. During this tour, you will be served breakfasts, four lunches, and dinners (including wine). You will have two of your lunches at Green Valley and Alexander Valley AVA (American Viticultural Area). You can go on an optional challenging climb at Alexander Valley AVA. The rest of the payment should be paid 95 days before arrival. Sonoma on a Bike offers a hands-on opportunity to discover all the hidden adventures through cycling, wine tastings, gourmet treats, and local cuisines.